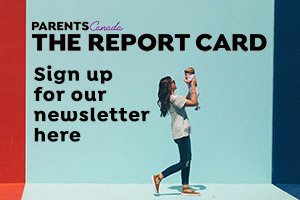 THREE-YEAR-OLD GABRIEL explodes into the rehearsal studio flinging himself into the arms of his mother, Sonia Rodriguez, principal dancer with The National Ballet of Canada. Her face is radiant as the child wraps his small body around hers. 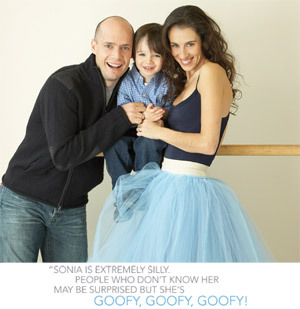 Sonia's husband, skating superstar Kurt Browning, and Sonia's mother, recently moved here from Spain, follow in Gabriel's wake. What are you like as parents? Kurt: I'm goofy with him. Hes a goofy kid. I'm loud. Sonias' silly. Theres a lot of dancing, bouncing, music and tempo in the house. I realize that there are not many 40-year-old dads who dance around the kitchen floor, but you are who you are. Sonia: I love being silly with him just running around and feeling like a kid again, like rolling around from room to room thats really fun. Hes a very active kid. Kurt: Sonia is extremely silly. People who don't know her may be surprised but shes goofy, goofy, goofy! Her father was like that too shockingly suave and silly. Sonia can make Gabriel laugh whenever she wants. Kurt: You only get one shot at it. I had a really great open relationship with my family where I could tell them anything. I want Gabriel to know that he can trust me; that when the bad things happen, its okay to tell me. You build it from now. Its really important that children believe what you say. Don't play games. Who's the softy on parenting? Sonia: What did Kurt say? (laughing) ... I'd say Kurt. But I think we pretty much see eye to eye on parenting. Which parent is Gabriel most like? Sonia: My mother says that at times Gabriel's a little uncontrollable. I wasn't like that, so I gather that thats from Kurt. Apparently Kurt was like that as a kid. Gabriel's smart. (Aside to Kurt) Did he get that from me, honey? He focuses like I focus. Kurt's a little more scatter-minded. Kurt: Mentally, hes most like Sonia. Its a wonderful gift that he got her thought processes. Hes a very focused child. Physically I'm very quick, but if I have to organize something, like get dinner ready, it takes all day. Except if its a speech; I can write. Sonia, dancers live by their bodies. Was it scary to be pregnant? Sonia: I loved being pregnant. I felt beautiful. But I looked funny dancing with this great big belly. Did you ever consider not going back to work? Sonia: No. I definitely knew I wanted to go back. I was a principal dancer so I was at a very good point in my career. I'm very fortunate with my body. I went back at two months (after the birth) and was back on stage at four months. Has being a parent made you a better artist? Sonia: Perhaps. Its hard to tell. Like any artist, you draw on your experiences from life. Having a child just adds to that. When I perform The Nutcracker, I look at it very differently now that I have a child. I'm more aware of how it affects him; how he sees it. I see life in general through different, fresher eyes. Everything is newer. Things you took for granted, you get to experience again. I think all that adds to being a better artist. Kurt: No (laughing). Its changed some of the programs that Ive done. Ive done some stuff for him. It changes your life, but you're still the same person you were before you became a parent. Have you started Gabriel dancing? Sonia: I don't have to (laughing as Gabriel gallops past). He loves any activity that involves music. He knows that I dance. Hes been to a few rehearsals. What happens is that he wants to get actively involved so I cant take him to the studio as much as Id like. But he loves watching. The moment people stop dancing, he starts clapping and says Again, again. Kurt: His first time skating, he didn't want any help within 30 seconds. But then he fell. We got a little overconfident. He spun out of my hand, hit his cheek on the ice and was bleeding. So then he was in his moms arms, but when we put him down, he kept on skating with the tears running down his face. How do you juggle physically exhausting careers with parenting? Sonia: Its difficult, very difficult, to find a balance. Its a hard thing to juggle. Both our careers take a lot of time and energy, and you need to really focus on yourself. By having a child, that focus has to be shared. Its a difficult thing to do. When I'm at work, I'm at work. Thats my main focus because I need to do that. Then when I go home, he needs my full attention. Thats how I try to juggle it. I try not to mix the two. When Gabriel's around, I try to make him my main focus. Kurt: You prioritize your life when you have a kid. It took months and months for me to realize that. I just didn't get it at first. Now when I get home, I see whatever needs to be done and just do it. Just like most parents. We looked at each other one day and said, what did we used to do with all our free time, which we thought was none, before we had a child? Right now I'm having trouble getting new tires for our car. I just cant seem to get it organized. Sonia: We try to get away to the cottage whenever we can. Do you ever feel guilty about not being there? Sonia: I haven't. I guess the guilt comes from when I'm at home and I feel so drained from work that I have to make a conscious effort to be there. I don't have the luxury of going home after a seven-hour rehearsal day and doing nothing. I have a child who's been waiting for me to get home and expecting to have my full attention and energy. And thats when it gets hard there are times when I feel cranky, tired and irritable. Sometimes I need time for myself. Do you have outside help? Sonia: I have my mom. I was very, very lucky. For the first three years, we also had a nanny. Now my mom has moved to Canada full-time. She goes back in the summers to Spain, but shes here when I need her the most, which is when I'm fully at work and performing. I can feel very comfortable that Gabriel's being taken care of when he gets out of school and I'm not home. So I can be at work and do my job. I have no worries. Kurt: Its hard for Sonia sometimes. When I go away, I go for five or six days at a time. I'm gone tomorrow for five days, then back for two and then I'm gone again for four days. Whats your favourite way to spend time with Gabriel? Sonia: I like cuddling up and reading he loves to hear stories whether from a book or just making up stories. He likes when you tell stories about him; things we've done together, or a trip we've had. The cuddliness is great he gets big points there. I don't know if thats going to last forever so I'm trying to get as much as I can. Kurt: Gabriel and I play physically a lot. I think most fathers play physically with their kids. We like to play tag and fall off pillows together. Sonia: We have a Portuguese water dog and a 13-year-old cat, Callie. We called her that because shes a calico. We practiced parenting on the dog. What are your dreams for Gabriel? Sonia: I want him to be happy in whatever he chooses to do. I have no desire for him to go into our professions unless he wants to; then I'd be very supportive. Dancing has been a great career for me but it can also be very difficult. I know how hard that life is. Kurt: It'll be nice to see what Gabriel brings into our lives from a different angle. Like my skating has allowed my parents to travel all over the world all because their kid could skate. Gabriel will be a surprise. Sonia: I hope he has music in his life. I think thats a wonderful gift to have. We have a piano and we want to get him started. I've just started taking lessons too. Kurt: We're very driven people. Both of us have reached as far as we can reach in our professions. Its exciting to really know what you want to do. I hope to help him find a channel too; something he can do with as much love and passion as we have for what we do.